This election season has seen lots of talk (and demagoguery) about whether investors, entrepreneurs, and small business owners should be hit with class-warfare tax policy. And there’s also been lots of sturm and drang about the best way of averting bankruptcy for Medicare, which is the federal government’s health care program for the elderly. But there’s been surprisingly little discussion so far about the issue of Medicaid, which is the federal government’s health program for poor people. I’m not prone to optimism, but I can’t help but wonder if this is because even statists grudgingly accept that the program needs to be reformed. If so, the right approach is block-granting the program back to the states. Here’s some of what Paul Howard and Russell Sykes had to say about the issue in the Wall Street Journal. Medicaid, America’s safety-net program for more than 62 million low-income uninsured Americans, is broken. It’s broken at the state level, where program costs are swamping state budgets. It’s broken for federal taxpayers, as Medicaid waste, fraud and abuse drain tens of billions of dollars from federal coffers every year. …The best hope for Medicaid reforms that can improve care for low-income enrollees, reduce fraud, and put the program on a sustainable trajectory is to cap federal spending to the states by using block grants. Block grants would offer states a predictable source of federal funding in return for broad state flexibility in Medicaid administration, benefits and copays. Howard and Sykes explain that the federalism approach already has been tried with welfare reform, which was very successful. We know that well-designed block grants can work and attract bipartisan support. The best example is the successful 1996 Temporary Assistance for Needy Families program for welfare reform, which helped move millions of women and children out of poverty and into the workforce. Critics of Medicaid block grants argue that they would leave insufficient funds to cover new state expenses, creating a “race to the bottom” as states slashed funding on services for the poor. But such objections were also raised about block-granting welfare, and they turned out to be wrong. They also reveal some very useful and interesting information about a test program in Rhode Island that shows the benefits of shifting health care decisions to the state level. In 2009, Rhode Island accepted a five-year cap on combined state and federal Medicaid spending as part of a waiver from the federal government. ..To date, Rhode Island projects that by various new measures—focusing on community-based care that keeps seniors out of expensive nursing homes, for instance, and medical supervision that can keep children and adults out of emergency rooms—the state has saved $100 million. The flexibility to plan care has also helped reduce its projected Medicaid spending rate to 3% from 8% annually. It’s worth noting, by the way, that Rhode Island is a very left-leaning state. Indeed, one of the reasons why I’m semi-optimistic about Medicaid reform is that governors and state legislatures – regardless of partisan affiliation – know that the current Medicaid system is unsustainable. For more information, here’s my video explaining why block grants and federalism are the right way of dealing with Medicaid. Since I’m not used to being optimistic, let me also give you a nightmare scenario for how this issue could evolve. My greatest fear is that a future president (perhaps Romney!) will decide to impose a value-added tax. In normal circumstances, that might upset state politicians since it would complicate their efforts to impose sales taxes. 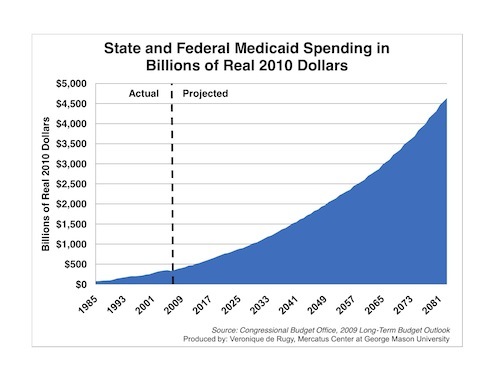 But if a future President promised to have the federal government take over 100 percent of Medicaid financing, I suspect state politicians would jump at the trade. So we would get the worst of all worlds. A giant new tax and more centralization. P.S. Here’s the full three-part video series on entitlement reform. He who pays the piper calls the tune. Block grants don’t change that, it simply changes the Federal government from the DJ to the one determining the station format and picking what can be on the playlist. Still calling the tunes. This looks like a reasonable solution that has the benefit of respecting our federalist traditions, while stabilizing Medicare. I know Cato can’t come out and endorse candidates, but a word or two about Gary Johnson wouldn’t hurt. His platform and his record endorse exactly the policy you’re discussing in this post. Here you go. They are a little dirty.